Taita Hills, Kenya, May 2017. Length is about 11 mm. The immature stage of Robber Flies, like all flies, are worm-like larvae, often referred to as maggots. Robber fly larvae live mostly in rotting logs or thick layers of organic mulch. 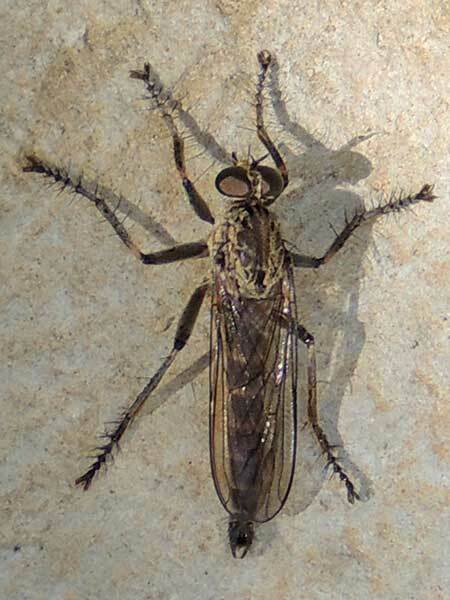 The adults of robber flies, like the one pictured here, are aerial predators equipped with talon-like tarsi and a very sharp, beak-like proboscis. With fast precision flight they capture flying insects, including bees and wasps, directly from the air. Their eyesight is likewise very acute and thus approaching them for a photo requires patience. On the other hand asilids often perch on a sunny rock in the open where they can maintain optimum body temperature while watching for passing prey and rivals. Copyright Michael J. Plagens. Page created 26 Aug. 2017.